Brandon Ingram smiles before his end of season interview on April 10, 2019. What started off as a “pinch” under Brandon Ingram’s armpit soon developed into something more sinister. Inspection by the Lakers’ medical staff in early March revealed a Deep Venuous Thrombosis — also known as a blot clot — in his right arm. The news hit Ingram with some extra heft due to the recent saga of Chris Bosh, whose career ended at 31 years old due to a blood clot discovered in his leg in 2016. “When I initially heard about it, I was kind of worried,” Ingram said at his end of season interview on Wednesday. “I heard people talk about the Chris Bosh thing. I think people around me kept me grounded, kept me smiling. Ingram was initially diagnosed with a “sore right shoulder” in early March, and he didn’t foresee how the magnitude of his condition would grow. In fact, he joked that he was worried that coach Luke Walton would razz him for being “soft” for complaining of soreness. A few days later, Ingram found himself at the Ronald Reagan UCLA Medical Center, where he underwent thoracic outlet decompression surgery — a procedure that involves removing part of his rib in order to excise the clot. 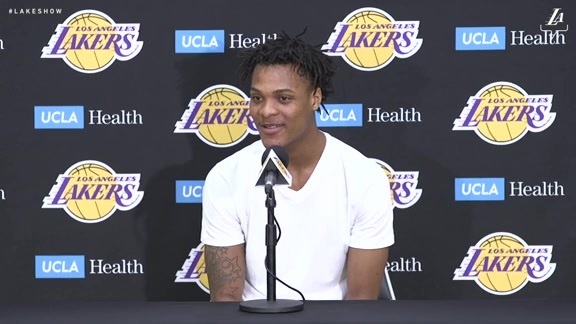 Ingram’s post-surgery activity has been minimal, primarily because the process required him to be on blood thinners. Lethargy is a new feeling for Ingram, who prides himself on his dedication to basketball, often saying that he has few, if any, hobbies outside of the game. Ingram — who said he spends eight hours a day working on hoops — hasn’t even picked up a basketball in over a month. Ingram’s support system has been his key during this trying time. He credits his teammates for surrounding him with positivity; his coaching staff for making him “a tougher person, tougher basketball player every single day”; and Lakers fans for wishing him a successful recovery when they see him in public. When Ingram — who is expected to make a full recovery before the start of next season — does return, he’ll look to regain the star form he was playing in before the clot. In six games post-All-Star Break, the 21-year-old absolutely dominated, averaging 27.8 points and 7.5 rebounds while shooting 57.0 percent from the field. To Ingram, it was as simple as learning to stop overthinking his approach. One of the youngest players in his draft class, Ingram is far from a finished product. While he thrived on attacking the basket and splashing fadeaways, the North Carolina native still has plenty of room to grown when it comes to his physique and shooing. Although Ingram’s blood clot cost him the final 29 games of the season and an uncertain amount of his offseason, it has brought him a greater appreciation for where he is as a person. “It’s given me a better perspective on life itself,” Ingram said. “Without basketball, I’d have no idea what to do. It just brings a little added motivation. Don’t take for granted things.